The Pirate Combo bouncer is everything you'll need for your little pirate's party. Complete with a large bouncing area, a safe climbing ladder, a 13 foot slide, pirate graphics, and large netted viewing windows you'll want to capture moments that you can treasure for a lifetime. With inside and outside basketball hoops, a pirate flag, fake wooden beams, and cannons inspired by a real pirate's ship, you won't be able to keep your kids out of this adventurous inflatable. 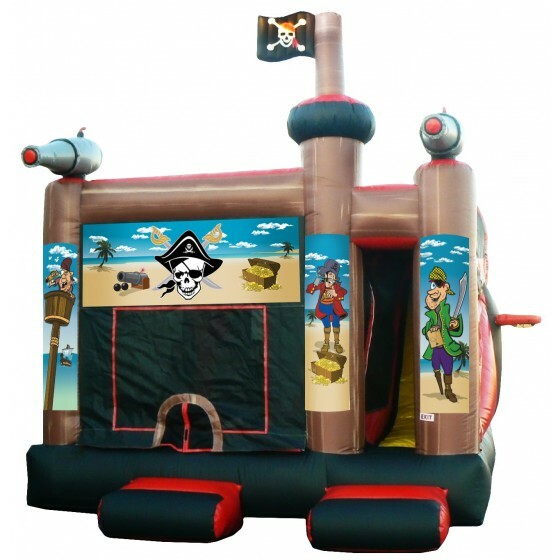 So gather your crew and climb aboard this Pirate Combo Bouncer!